I hope you have all have had a happy and healthy summer. This was my first summer living full-time in Santa Fe. I enjoyed the busier summer Santa Fe lifestyle with the SOFA-WEST show in July where Holsten Galleries presented another one-person show of new works by Maestro Lino Tagliapietra. We also enjoyed going to the Santa Fe Opera to see both The Magic Flute and Madame Butterfly and attending Indian Market in August. Christine and I are just back from a wonderful trip to Provence and enjoying a slightly cooler and less busy September. 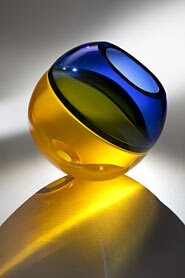 I am proud to be representing Seattle based glass artist, John Kiley. 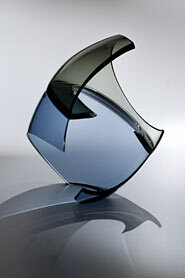 I consider John to be one of the most promising up and coming artists on the contemporary glass scene. I first got to know John and his work when visiting Seattle for a Lino event several years ago. John has long been one of Lino’s top assistants when the maestro works in Seattle several times a year. In the two or three years that I have represented John his work has grown exponentially. 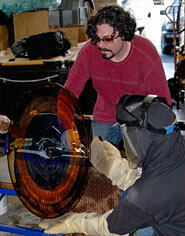 When glass collectors ask for tips on who are the names to be watching in the next generation of American glass artists, John’s is always one that I mention along with that of Nancy Callan and a couple of others. Evidence of the fact that collectors seem to be in agreement is the fact that at the recent annual auction at the Tacoma Glass Museum, John’s piece not only sold for considerably more than the estimated value but John was also chosen at that auction for the People’s Choice Award! A short video of John’s residency at that Museum can be seen here. John has generously given me exclusive representation of a brand new body of work for the next few weeks. Here are a few examples of that body of work. To see the others please visit John’s page on my website. Kenn Holsten was the first person to represent my work. It has been a true pleasure to work with Kenn, and his thoughtful insight is an invaluable resource. Being this month’s featured artist is particularly exciting, because we are debuting several new pieces and forms. The sculptures featured here, although varied in shape and color, share a consistent theme: connection, separation and balance. My goal is for the viewer to connect to a feeling conveyed through the physical piece and the transmission of light. "Curl" is a bit of a departure for me in that large sections of the original blank are removed on a vertical plane, allowing one to see the membrane in section. "Conscious" is a more traditional form with the addition of a lens ground into the convex membrane that forms the color separation. This lens de-magnifies the opposing opening and brings into questions perception vs. reality. We have a new piece available by Seattle artist Preston Singletary. "Raven Steals the Moon" is one of the best examples of Preston’s "Raven" series that I have seen. This is one of his best known series and is somewhat of a signature piece for Preston. 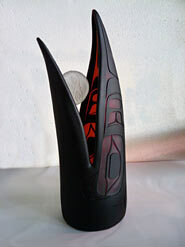 The piece evokes the rich narrative history and folklore of his native Tlingit tribe. 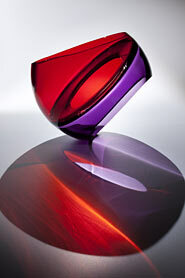 The 2010 Studio Editions by Dale Chihuly are still available for purchase . 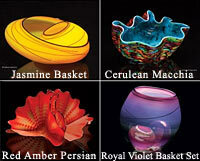 These small scale Chihuly works are some of the most beautiful ever made available. Here are images of the this year’s four pieces. Please feel free to contact me for prices which are substantially less than those for unique Chihuly works. I wish you all a pleasant fall season and look forward to keeping in touch. p.s. to respond, please do not click the reply button in your email program. Click on Kenn’s email address below.